The big question is whether this shows if people’s online behaviours are starting to change? Copyright infringement is still a concern. The results suggest 15% of all 12+ UK internet users have accessed at least one item of illegal content. Music, film and TV are the sectors most heavily affected. An advantage of the OCI tracker is that it allows us to look at why people use illegal content. Beyond the most obvious reason that illegal content is free; speed, ease and convenience are said to be important. The survey also asks what might stop people from accessing illegal content. Most people said access to cheaper legal services, more availability of content, and clear definitions of what is and isn’t legal. So the report suggests that easy access to a wide range of legal content, at a good price is the way forward. Is behaviour beginning to change? While infringement remains a problem, this year’s results suggests that positive changes are happening. With faster broadband speeds and mobile technology, predictions were that piracy would rise. But the survey finds that levels have stabilised and have even begun to fall. 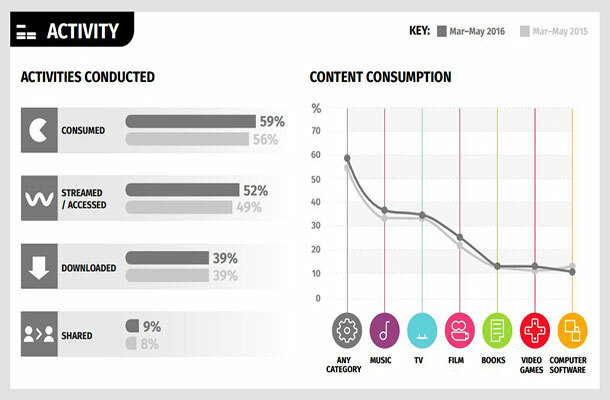 Consumers are increasingly using legal sources of content, primarily through streaming services. Streaming activity has grown significantly, outstripping downloading and sharing activity. This is reshaping the market. Top sources of content are leaning towards streaming subscription services. In particular, Spotify and Netflix are appearing to take away from downloading alternatives, such as iTunes and Google searches. This year’s results also find YouTube use has fallen amongst those who infringe. And there has been an increase in users replying to the survey saying that ease and convenience are why they are using paid services. The average quarterly spend on content through subscription services is now rising, which is also good news. Infringement is still a big problem, but the good news is that it is beginning to fall. At the same time, people are shifting towards streaming and subscription services. Are these related? We honestly can’t say. But these are issues we need to think about with the survey going forward. Are subscription services tapping into the motivations for infringing behaviour? Will new and innovative business models be the key to cutting piracy in the future? Will new and innovative business models be the key to cutting piracy in the future? And what will those new innovative business models look like? Watch this space! Thanks for your comment - to clarify, by illegal use (or infringement) the survey refers to the use of content without the permission of IP rights holders.